We created several entertainment areas - a billiard room, wine cellar, media area, gaming/wine tasting/dining area and a bar. The predominate colors are black, white and teal as the accent. In the media area we used a sectional sofa which was covered in a snake skin design fabric. The windows are flanked with white side panels with grommets which have a teal band at the bottom. In a second conversation area, we placed a pair of chairs in a faux fur . 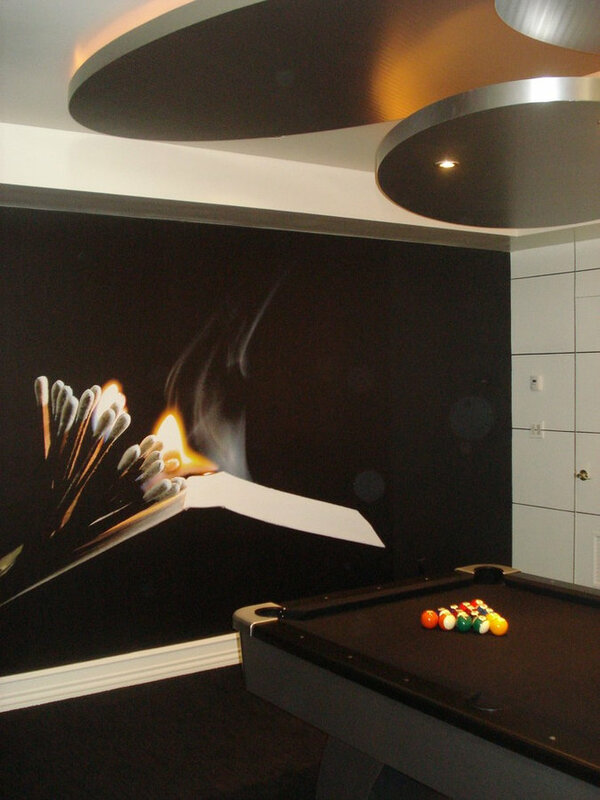 In the billiard area, we installed a mural of a book of matches on fire, which contrasts against the hard linear design of the walls, which were painted to look like blocks. The billiard table is chrome with a black felt. To also create interest on the ceiling, we suspended illuminated, chrome oval panels at different levels. The predominate colors are black, white and teal as the accent. 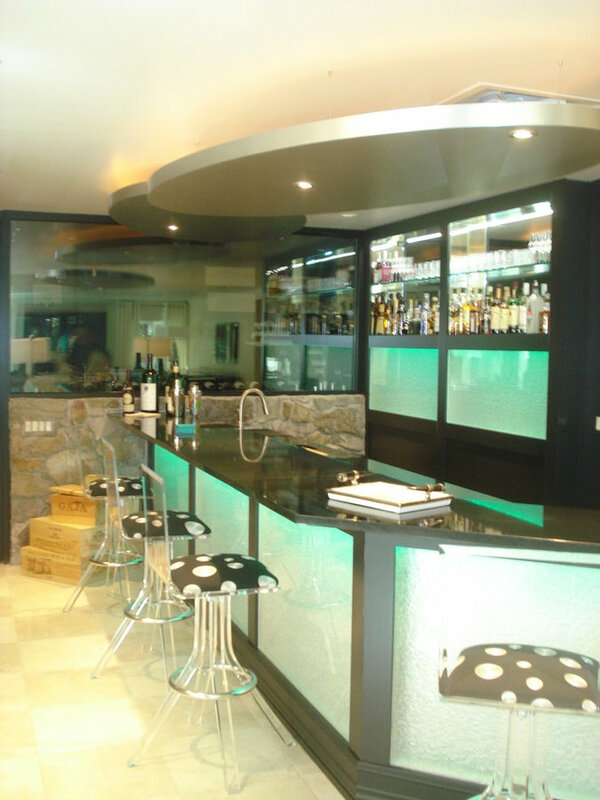 At the custom designed bar, we installed lucite panels with an led illumination system behind. To also create interest on the ceiling, we suspended illuminated, chrome oval panels at different levels . The lucite bar stools add interest in shape without taking away from the bar. Beyond is the glass enclosed wine cellar. 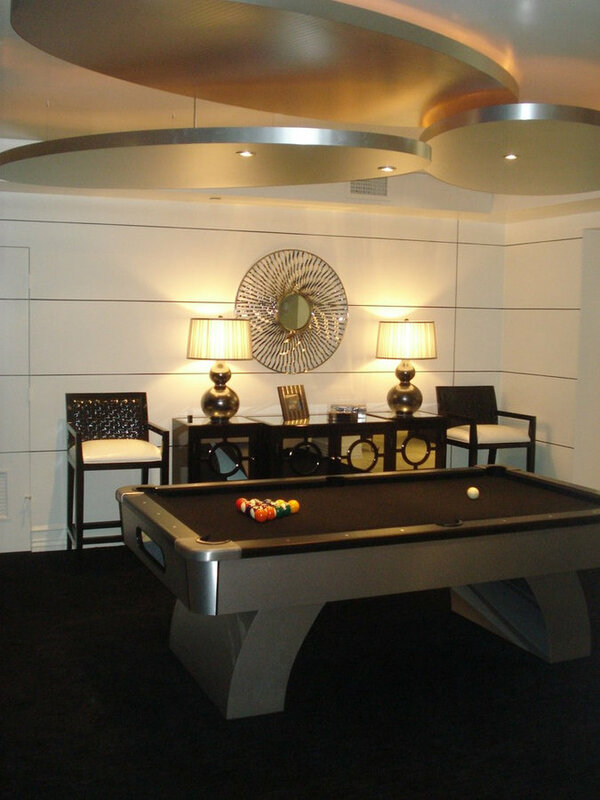 We created several entertainment areas - a billiard room, wine cellar, media area, gaming/wine tasting/dining area and a bar. The predominate colors are black, white and teal as the accent. At the gaming/wine tasting area, we brought a touch of elegance to this chateau. 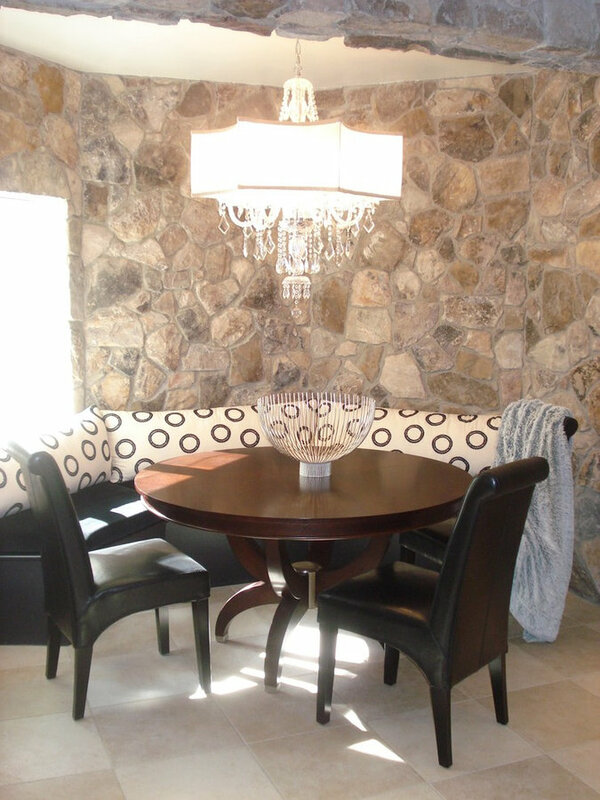 we installed a crystal chandelier centered on a banquet in a black and white circular design. We added the stone walls to the room to provide texture. The predominate colors are black, white and teal as the accent. In the media area we used a sectional sofa which was covered in a snake skin design fabric. In front of it, a rustic table is used as the cocktail table.The windows are flanked with white side panels with grommets which have a teal band at the bottom. 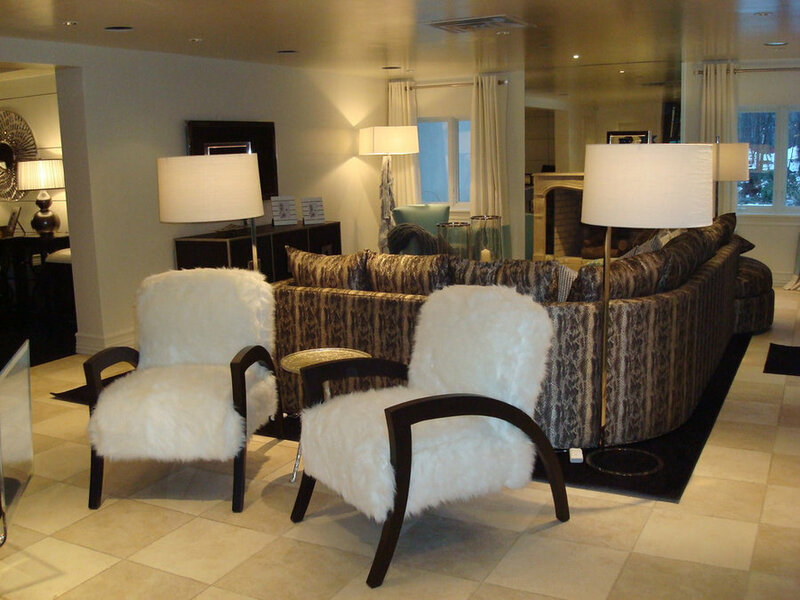 In a second conversation area, we placed a pair of chairs in a faux fur . The predominate colors are black, white and teal as the accent. In the media area we used a sectional sofa which was covered in a snake skin design fabric. In front of it a rustic table is used as the coffee table. 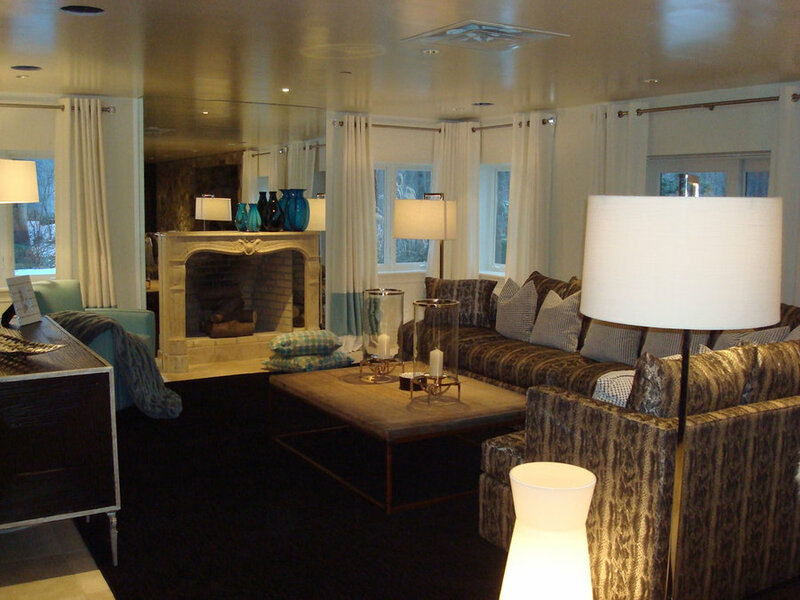 At the fireplace we used a french fireplace mantel but to give it that contemporary flair, we mirrored above it. The windows are flanked with white side panels with grommets which have a teal band at the bottom.